I wanted to make some handmade Christmas gifts for female family and friends this year. When I saw this tutorial by Emily at Jones Design Company, I knew I'd found my gift idea. The tutorial was linked by Kristi at Pink and Polka Dot. But, problem is, I'm not all that crafty. I don't like doing the same thing over and over. 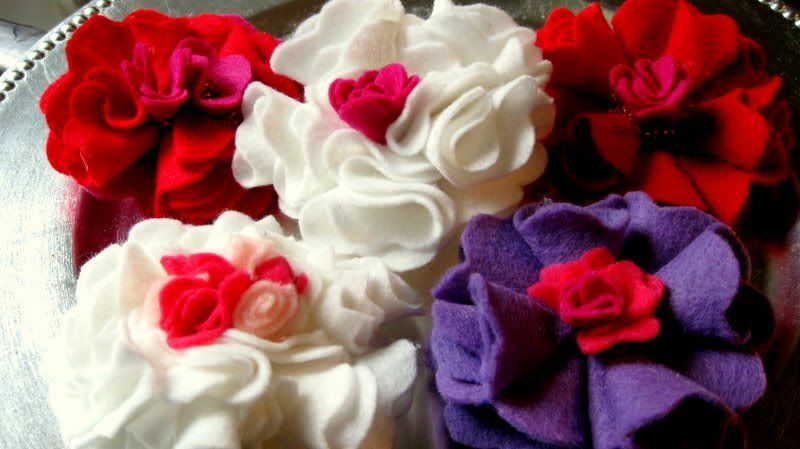 I loved the look of these felt flower pins, though, so I pushed myself to do repetitive tasks. Guess what. I got better with each flower. Duh. Those of you with Etsy shops know this already. By the time I had made twenty pins, I had put my own spin on the original tutorial, time flew by, and they started looking so good I hated to say goodbye to them. Oh, I kept a few good ones for my own coats. The lesson here for home stagers is that, even if you think home staging DIY projects like making a no-sew pillow, or painting a hutch, or rearranging furniture is not something you do well, just fooling around with it will get you good enough! So, dig in. Don't think that you have to be experienced, talented, crafty, or artistic to stage your own home. Take it step by step, fooling around as you go until it looks right to you. When I globbed too much glue into the center of the flower, I threw some red seed beads into it, disguising my oops. When four petals didn't seem full enough, I started adding another, and then filling in with even more, smaller petals. Who knew following directions meant you didn't have to follow directions. My eBook, DIY Home Staging Tips to Sell Your Home Fast and For Top Dollar, gives you simple ideas for dressing up your home, from lamps and pillows, to flowers and paint colors, from light fixtures to faucet handles, and door knobs to bookcases. Try it. You'll like it!